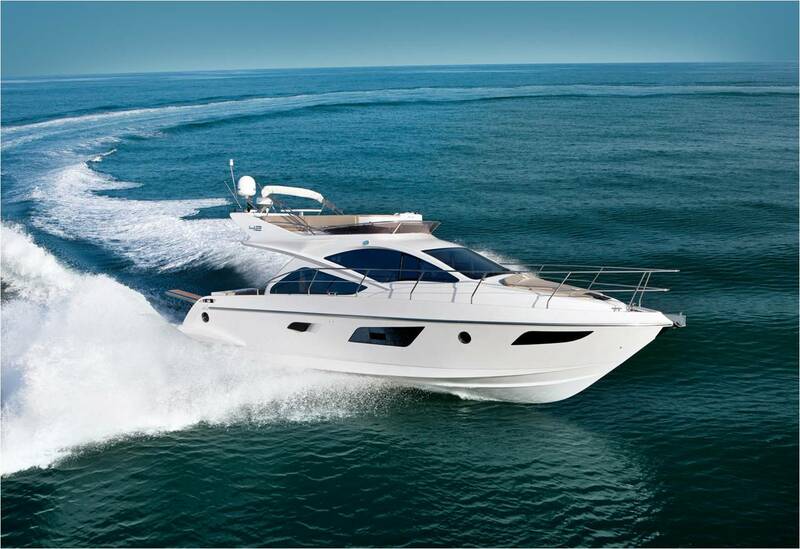 Introducing the smallest of the Brazilian built Intermarine range, the all new Intermarine 42. Its been a very busy and aggressive year of growth for Intermarine and this looks to continue well into 2012. 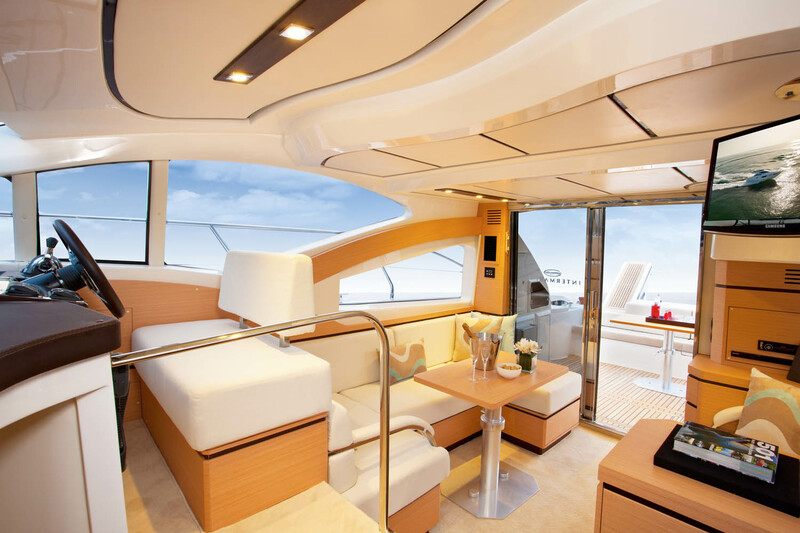 The 42 exterior was designed by the Miami and Viareggio based studio Luiz de Basto Designs, while the interior was projected by the interior designer Karol de Paula. 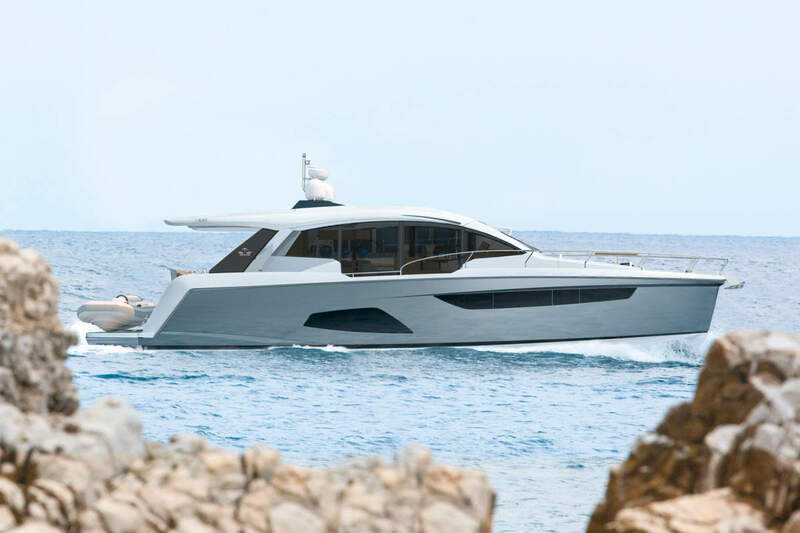 With almost 45 feet in total length, the new Intermarine 42 delivers much more than the expected from a yacht of its class. 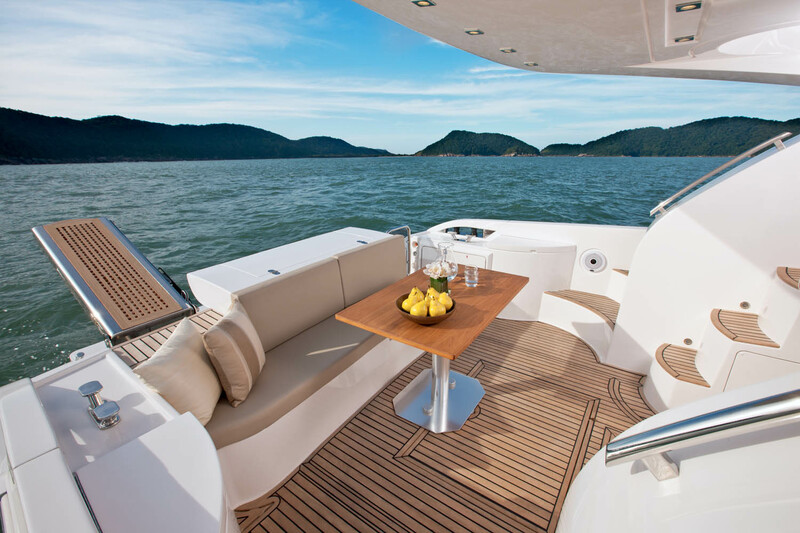 Conceived as the entry level model of the Brazilian shipyard, it gathers modern design, intelligent solutions in use of space, contemporary decor and excellent performance. 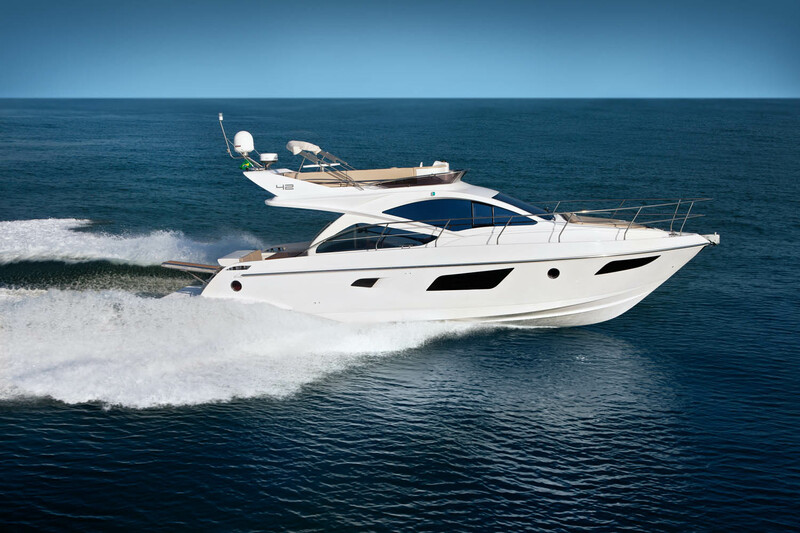 The new 42 is a yacht of remarkable presence. 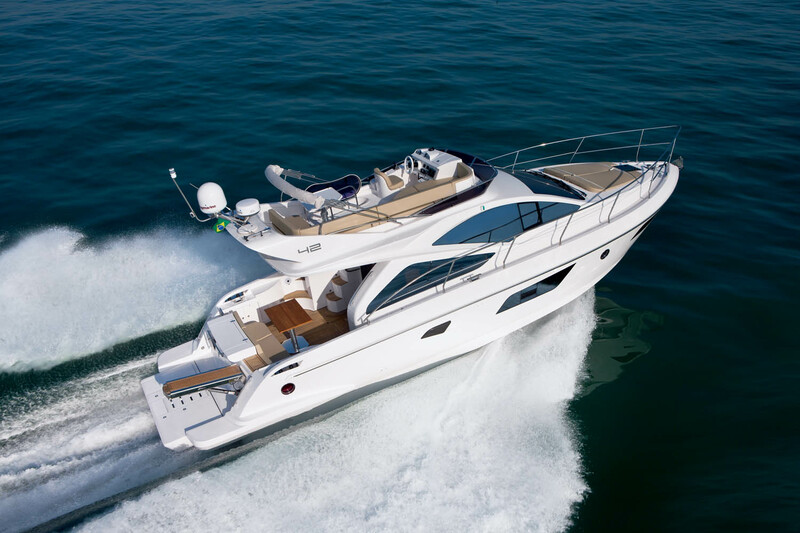 The original style of the large windows and the strong lines across the superstructure and hull sides compose a fresh and powerful design. The air intakes in carbon fiber add the final touch of exclusivity. 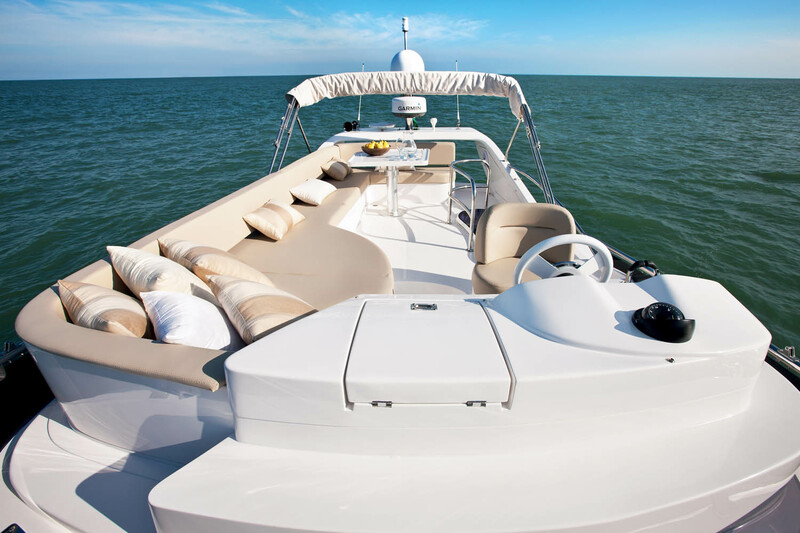 The large swim platform is equipped with hydraulic lift that allows hoisting with practicality a tender or jet ski or even make it a private beach on board. 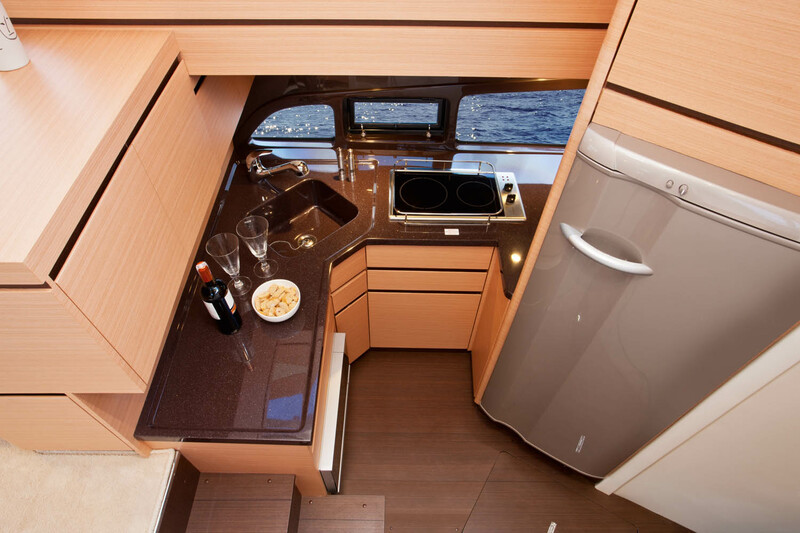 It also features a practical gourmet center equipped with sink, grill and cutting board, an innovation for a yacht of this size. 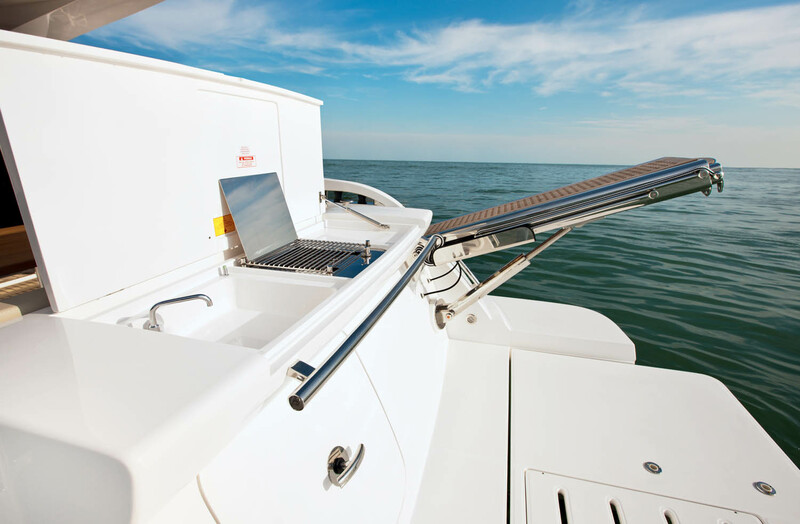 The hydraulic gangway is conveniently installed to starboard, optimizing the space of the swim platform. 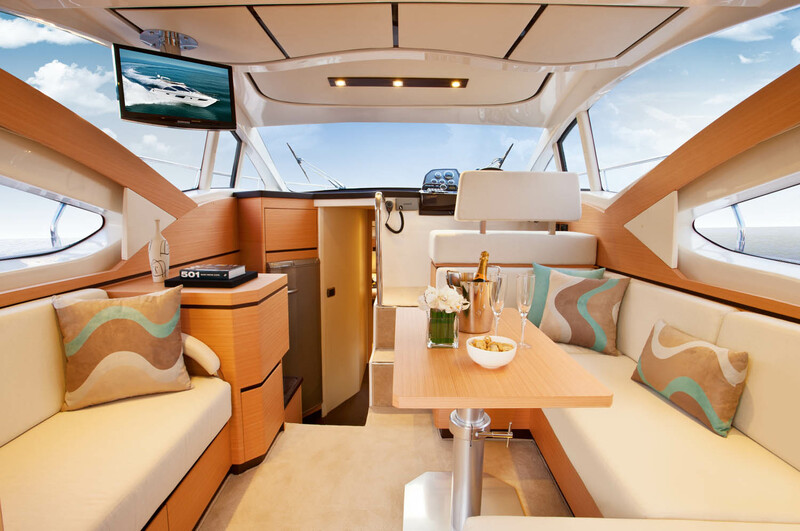 The cockpit offers much more space than the competitors and has a comfortable sofa, dining table, cooler and several storage compartments. 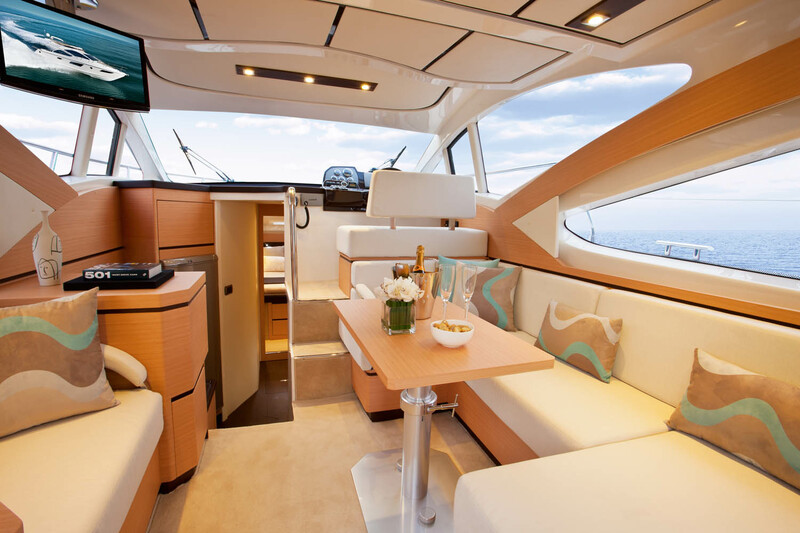 The flybridge is all about space. 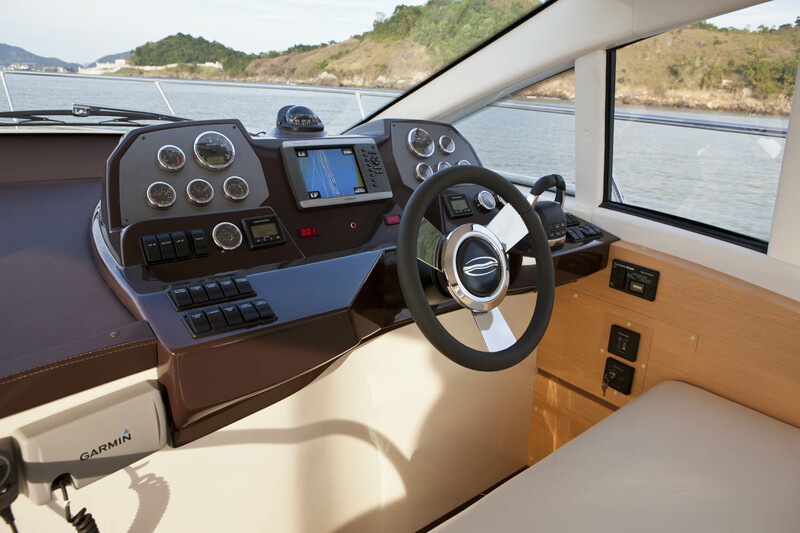 The helm station was carefully designed to offer maximum comfort and safety during navigation. The arrangement includes a large sofa with integrated sun bed next to the pilot and a practical table for meals. The large windows offer maximum natural light. The contrast between Tanganica and Wengé woods and the high quality materials make the interior definitively alluring. The living area has a large U-shaped sofa, an additional sofa, dining table, audio & video equipment and several storage compartments. 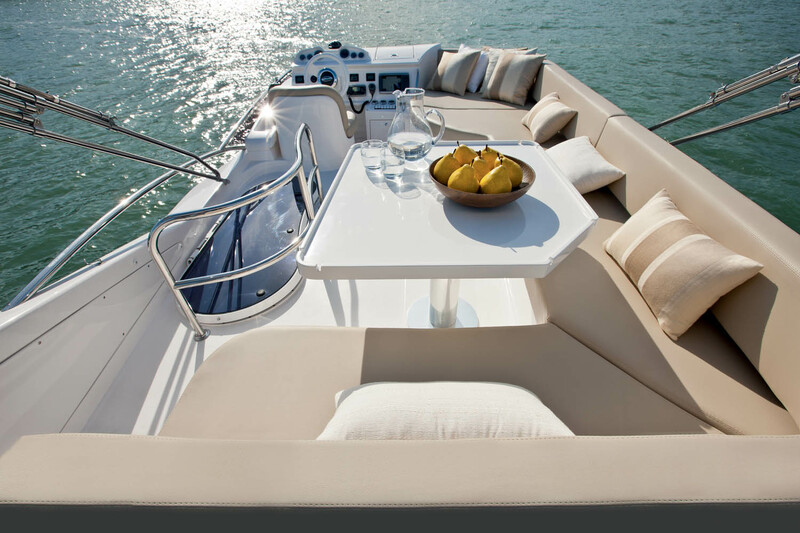 The furniture that separates the galley from the salon integrates storage and a practical bar, other unique feature of the yacht. The internal helm station has excellent visibility provided by the structurally reinforced windshield with no mullions at its center. Located on the lower deck the galley is airy and spacious. It has a 240-liter refrigerator, microwave, 2-burner cooker, several storage compartments and a large window with integrated porthole. 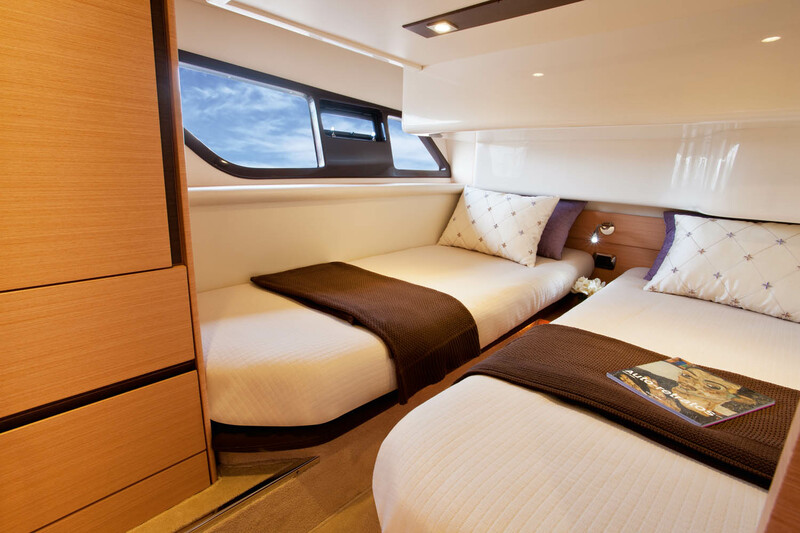 The master suite, located at the bow, is roomy and luxurious. It has a double bed, outstanding windows and large wardrobes. The master bathroom is impressive. It is comfortable, illuminated and has a separate shower box, other differential of the 42. The guest suite is the perfect space to relax. It has two twin beds that can be converted to a double bed through a sliding mechanism. The large windows offer privileged view over the sea. A private access to the bathroom, also accessed from the hallway, makes it practical and intelligent. 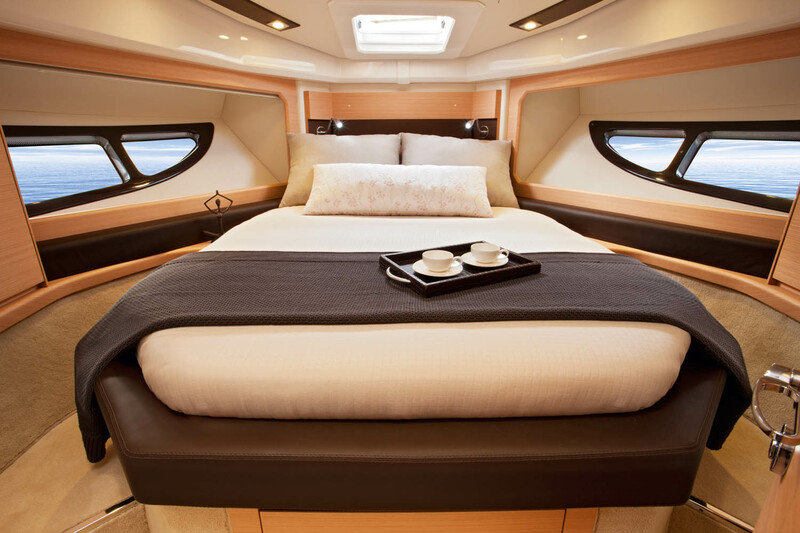 The new 42 can also have, as optional, a crew cabin, replacing the large storage compartment. This differential of the 42 is quite unusual for a yacht of its size and is primarily accessed through a door at the stern or from a lid under the cockpit sofa. 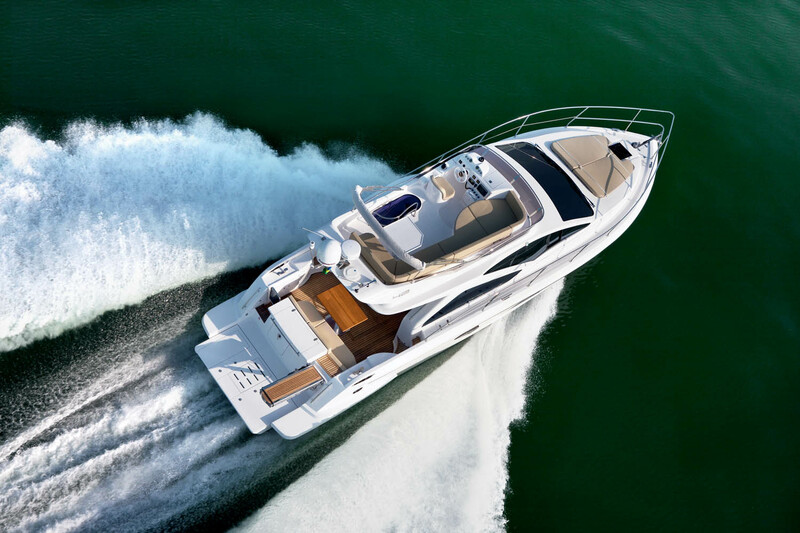 The new Intermarine 42 can reach a top speed of 31 knots and a cruise speed of 27 knots, very respectable for a yacht of its size. 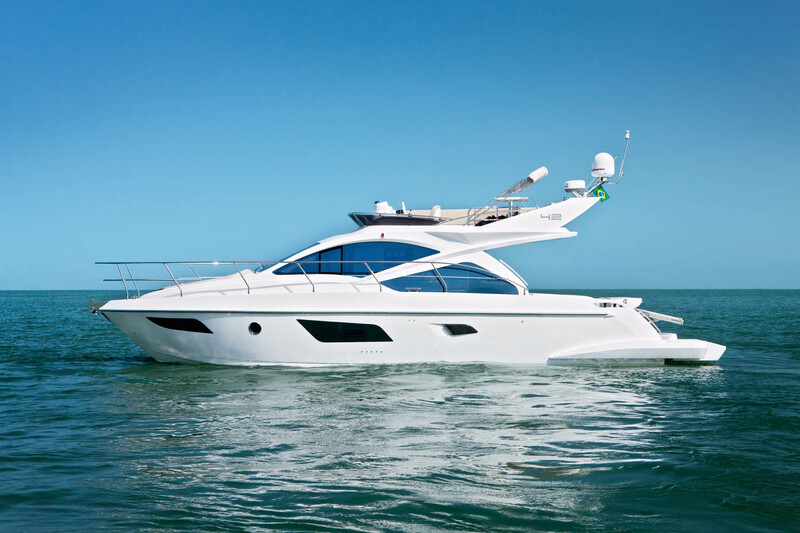 The new entry level model from Intermarine seems to be on the mark and could be an alternative to the European and US brands in this very competitive market segment.